When the Milwaukee Road abandoned its main line to the Pacific Ocean in 1980, only a few locations had a enough traffic to warrant continued rail operations. 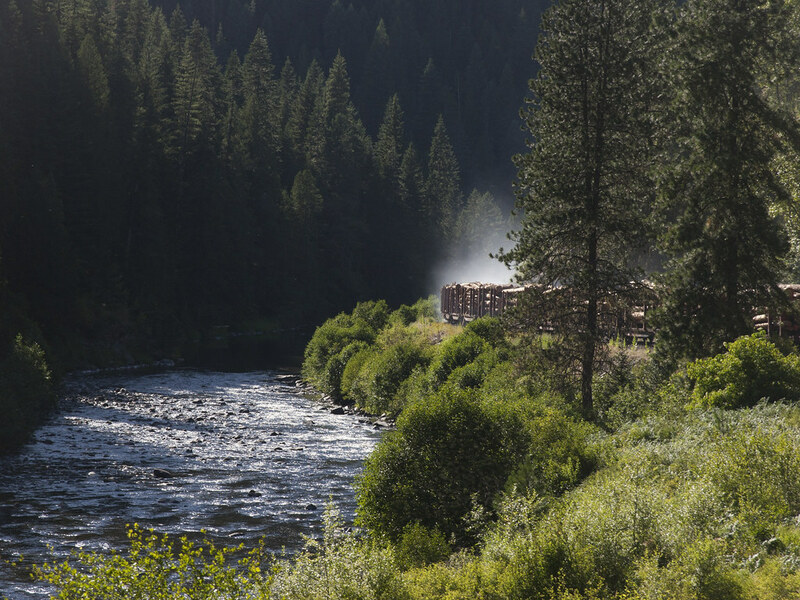 One of those was St. Maries, Idaho, where the sprawling Potlatch mill was generating dozens of carloads of finished lumber each week and receiving one hundred or more carloads of logs during the logging season. From the ashes of the Milwaukee Road rose the St. Maries River Railroad, operating the on the former Milwaukee main line to an interchange with Union Pacific at Plummer, Idaho, and up the St. Maries River to the log reload at Clarkia and, at the time, a Burlington Northern interchange at Bovill, Idaho. 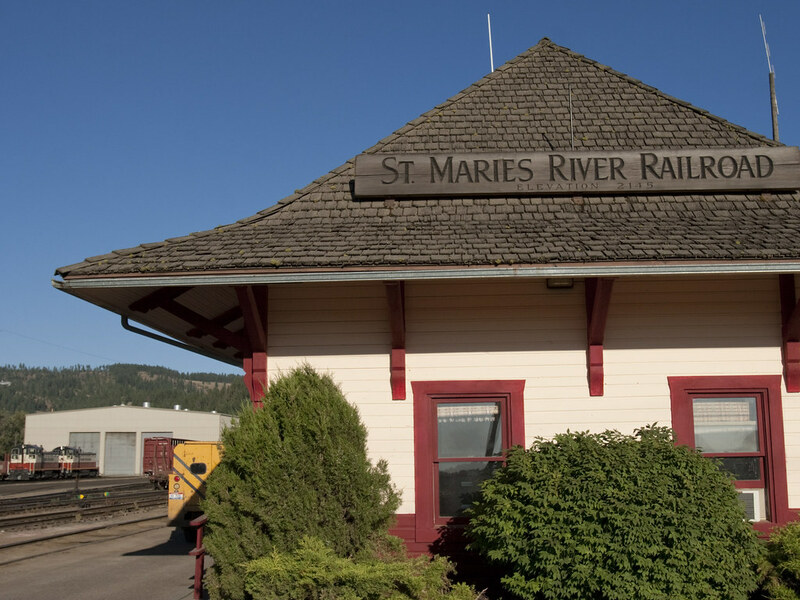 Operating out of the former Milwaukee Road depot in downtown St. Maries and almost exclusively with former Milwaukee Road locomotives, cars, and crew members, the St. Maries River Railroad was like a time warp. At the urging of Paul Didelius, good friend and photography mentor, I first visited St. Maries in 2002. I returned for a week every year except for one through 2008. Every bit as good as the railroading are the friendships I made with the railroad’s most ardent photographers—Marc Entze, Jim Davis, Camron Settlemier, and Rob Leachman. As of 2015, the railroad still runs to the Union Pacific interchange in Plummer, but operations on the branch to Clarkia ceased in 2008. 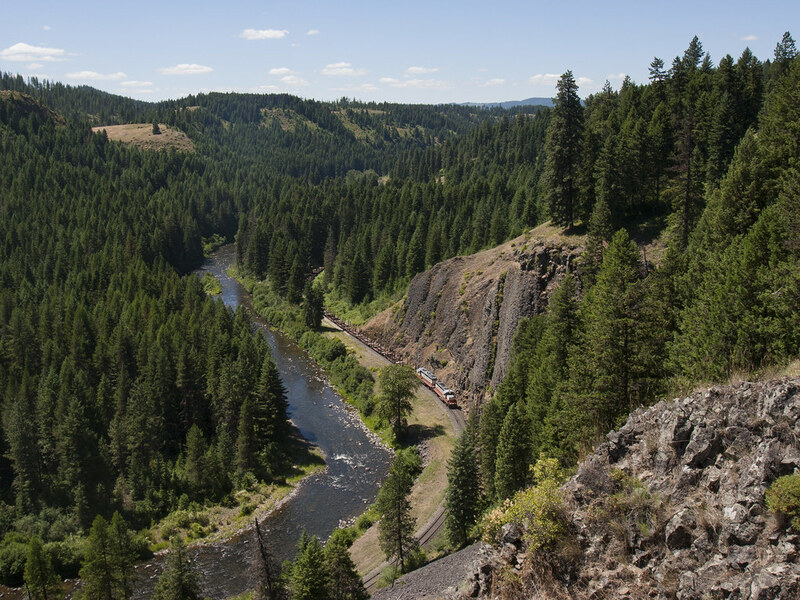 Without the log trains on the line up its namesake river, the railroad just wasn’t the same. I haven’t been back, but for those halcyon years in the first decade of the twenty-first century, St. Maries was, for me at least, the last best place to see railroading the way it used to be. The St. Maries River Railroad's inbound Clarkia logger crosses its namesake at Alder Creek, Idaho, in July 2004 with a trainload of logs from the Clarkia reload bound for the Potlatch mill in St. Maries. 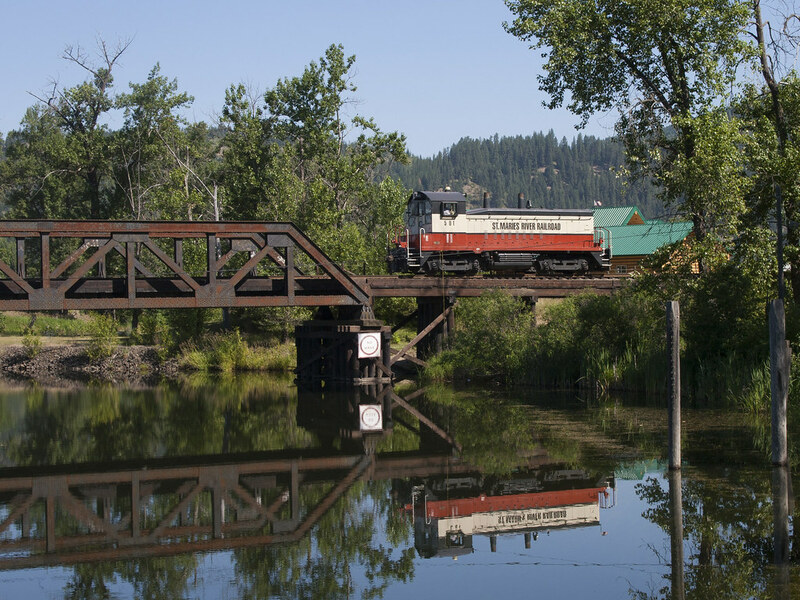 Caboose bring up the rear of the St. Maries River Railroad's inbound Clarkia logger crossing its namesake at Alder Creek, Idaho, with a trainload of logs from the Clarkia reload. 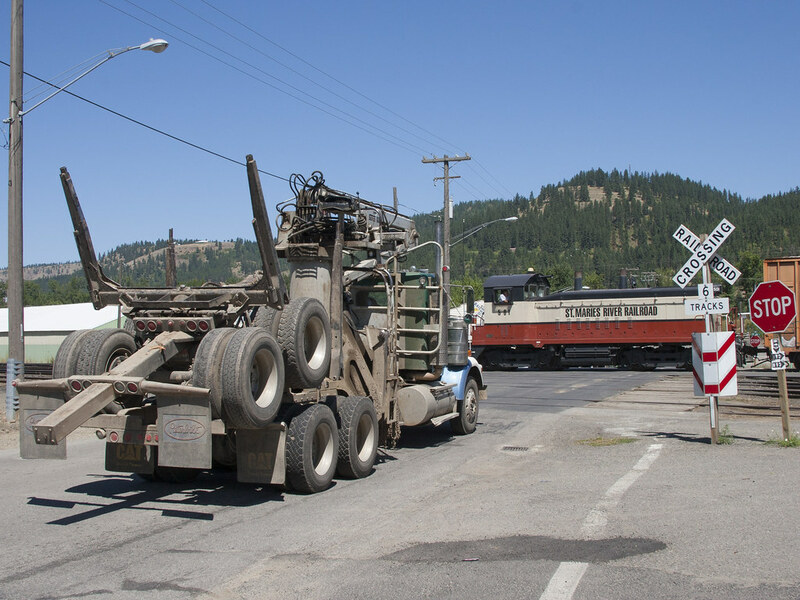 The St. Maries River Railroad's outbound Plummer Turn crosses a causeway at the southern edge of Benewah Lake with finished lumber for the Union Pacific interchange in Plummer. The train is on the former Milwaukee Road mainline just west of St. Maries, Idaho, on a bright July day in 2004. 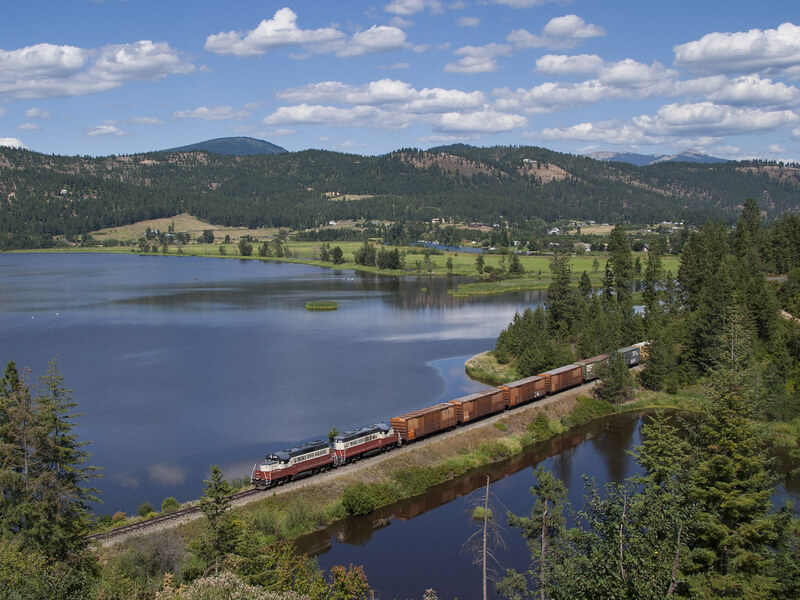 The St. Maries River Railroad's inbound Plummer Turn crosses the low trestle over Benewah Lake on the former Milwaukee Road main line just west of St. Maries, Idaho, as evening shadows creep across the mountains in July 2004. 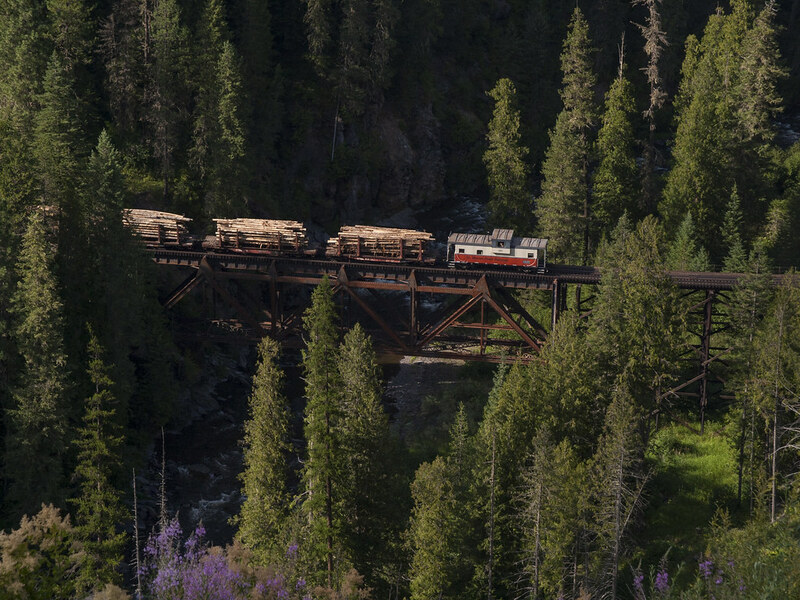 The St. Maries River Railroad's inbound Clarkia logger is deep in the canyon of its namesake in July 2004, bringing a trainload of logs from the Clarkia reload to the Potlatch mill in St. Maries. 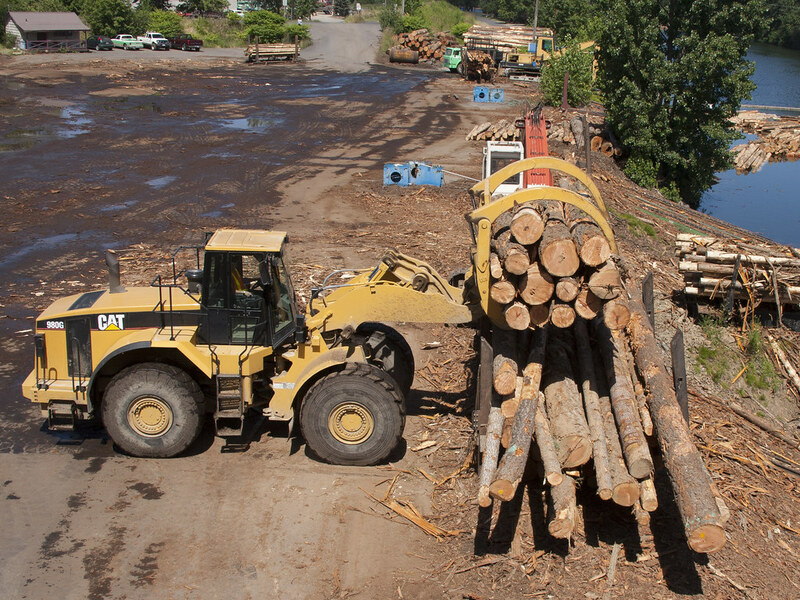 A front-end loader places a bundle of logs into a bin along the St. Joe River at the log yard in St. Maries, Idaho. Once the bin is a full, a worker will tie the logs with steel cable and then drop them into the river. 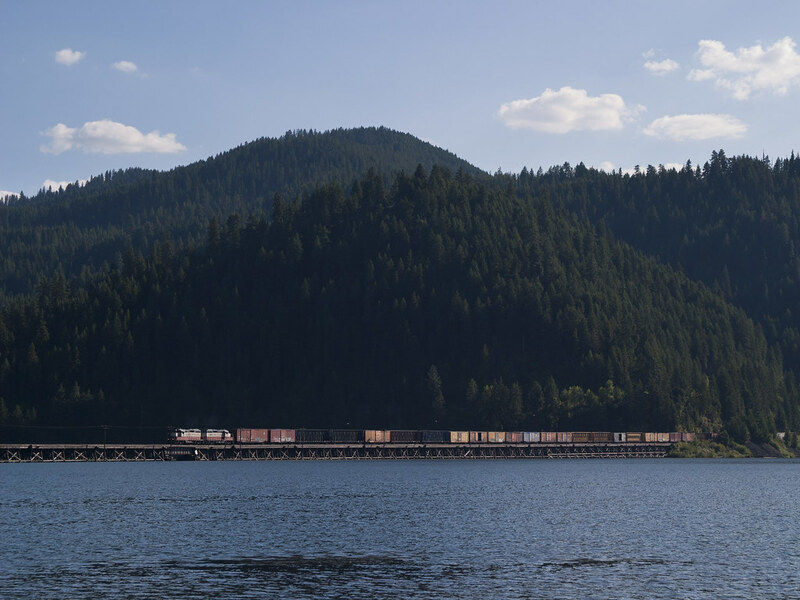 When enough logs are assembled to build a raft, a tug will take them across Benewah Lake to a mill in Coeur d'Alene. 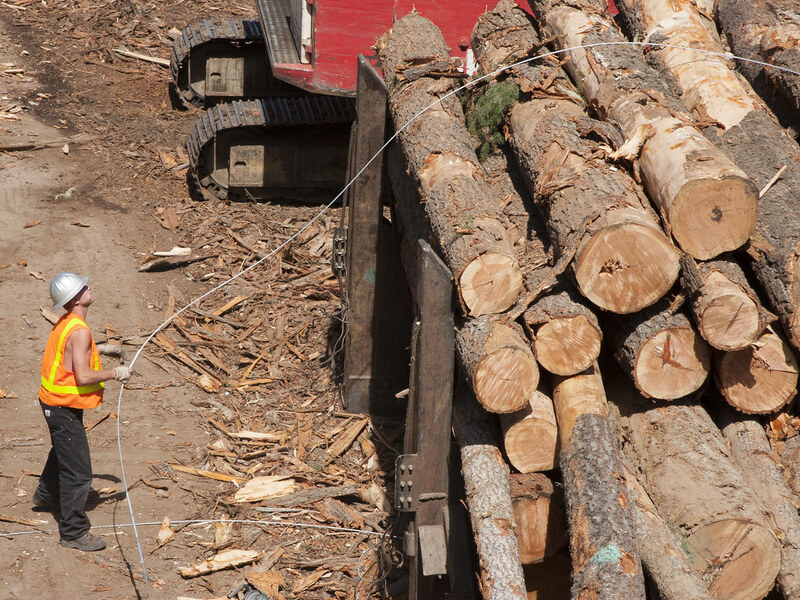 A Potlatch worker ties a bundle of logs with steel cable in St. Maries, Idaho. 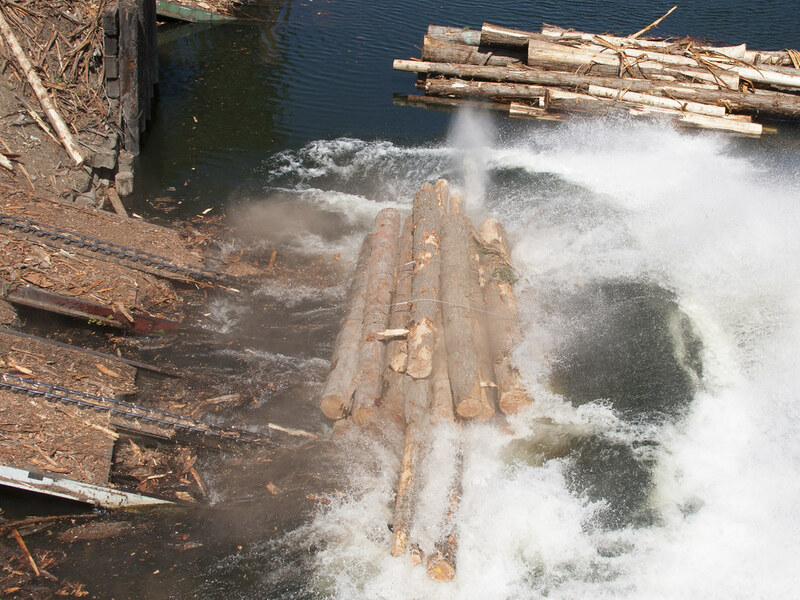 Bundled logs splash into the St. Joe River at the log yard in St. Maries, Idaho, in July 2004. 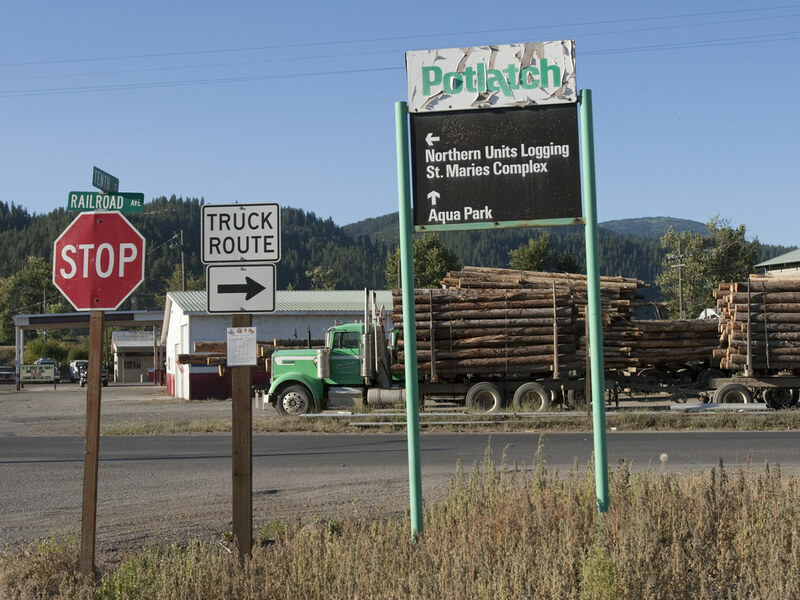 At the time, Potlatch was still building log rafts in St. Maries to float across Benewah Lake to a mill in Coeur d'Alene. 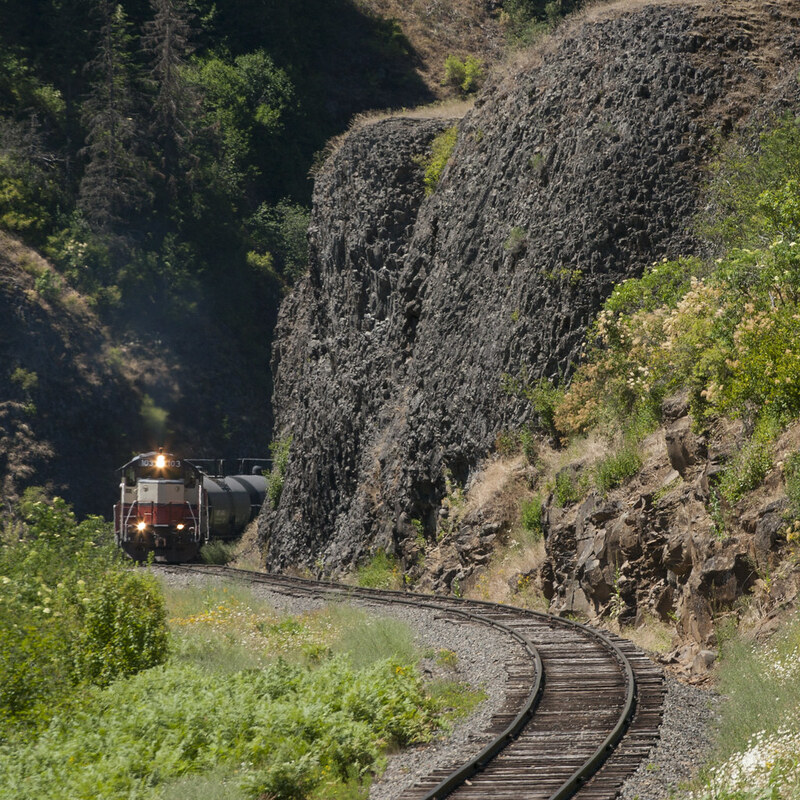 On a hot July afternoon in 2005, the St. Maries River Railroad's outbound Clarkia Logger rolls past basalt cliffs along its namesake near milepost 17 of the branch line running south from St. Maries, Idaho. 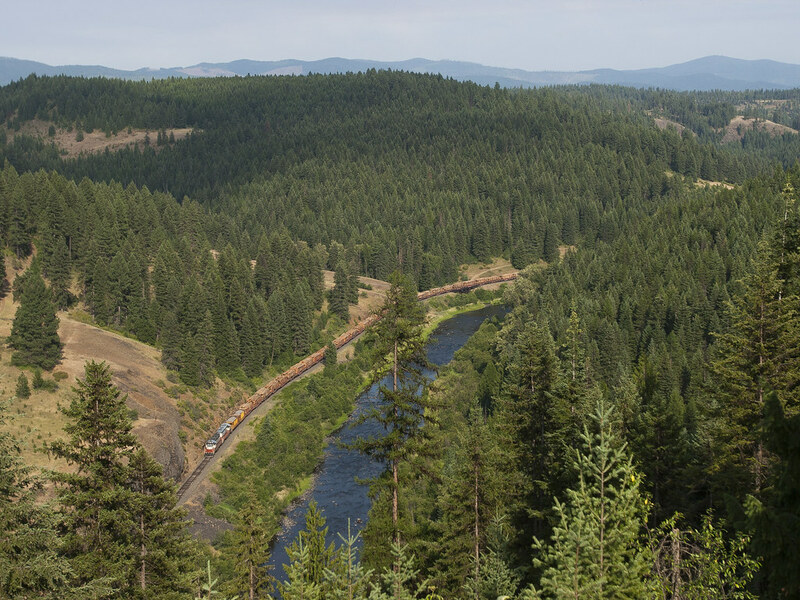 The St. Maries River Railroad's inbound Clarkia Logger brings a trainload of logs down its namesake near milepost 17. The single boxcar behind the two ex-Milwaukee Road GP9s is a load of garnet from the plant in Emerald Creek, Idaho. The St. Joe River casts a nearly perfect reflection of a St. Maries River Railroad SW1200 on a warm July morning in St. Maries, Idaho, in 2005. An empty log truck waits at the crossing in St. Maries, Idaho, while a St. Maries River Railroad SW1200 switches cars in the yard for an outbound Plummer Turn in July 2005. 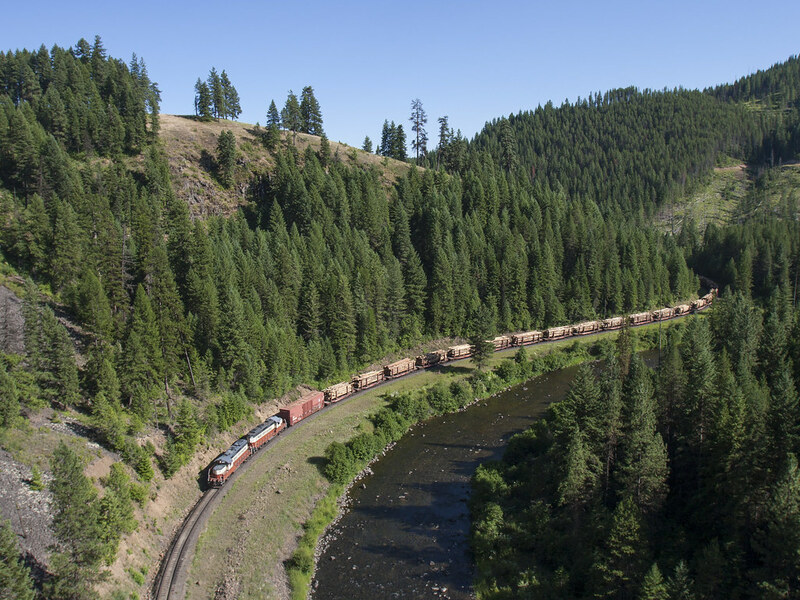 In July 2005, St. Maries River Railroad's outbound Clarkia Logger passes basalt cliffs near milepost 14 of the branch line extending south from St. Maries, Idaho, up the railroad's namesake river. 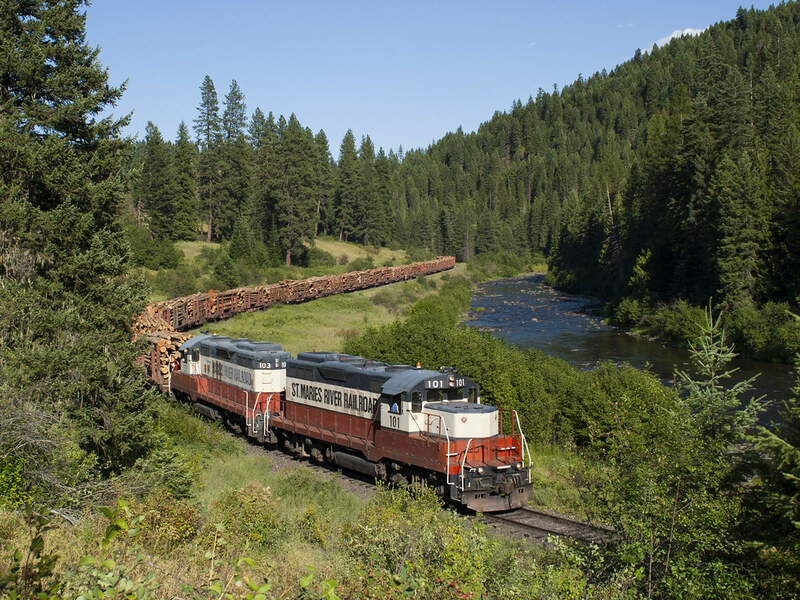 Former Milwaukee Road log cars roll up the St. Maries River in Idaho's panhandle on a July afternoon in 2005. 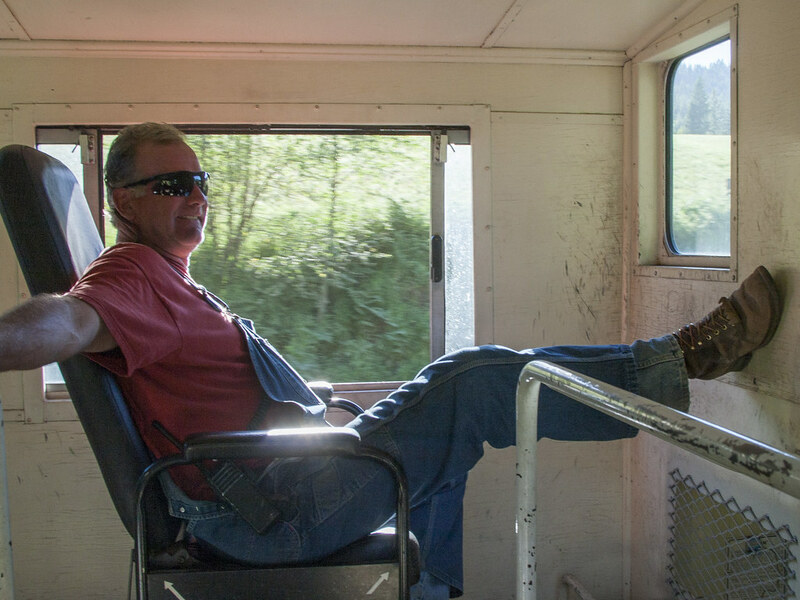 St. Maries River Railroad conductor Pat Hough waives from his caboose as the Clarkia Logger arrives in its namesake town to pickup a trainload of northern Idaho timber in July 2005. 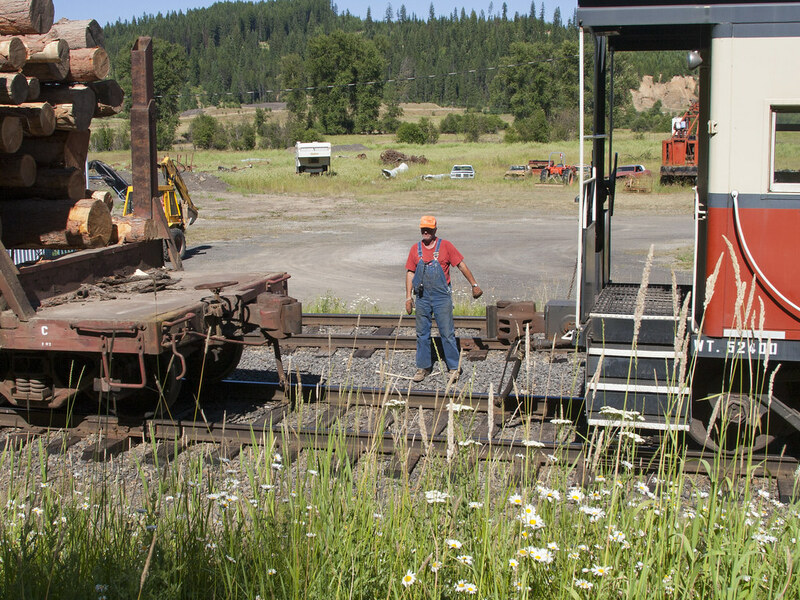 St. Maries River Railroad conductor Pat Hough guides the coupling of his caboose to the outbound Clarkia Logger. 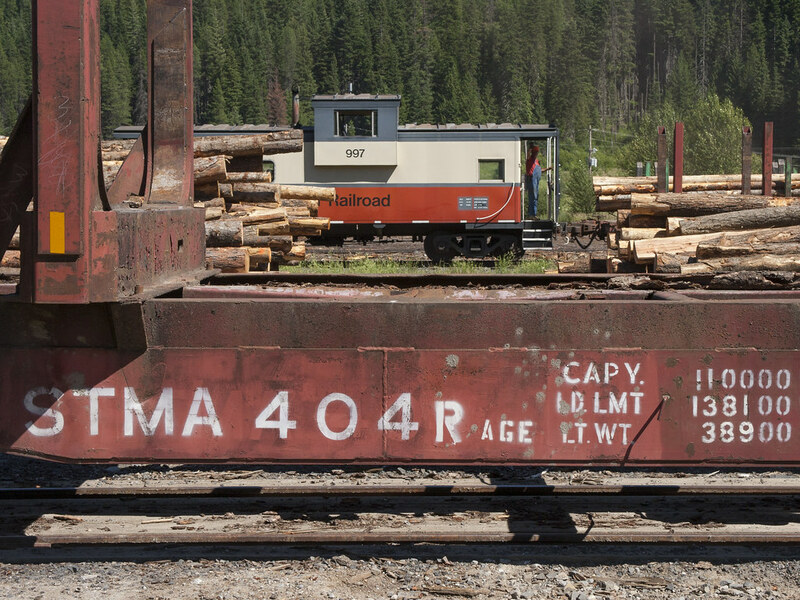 The train has just swapped its empty log cars for loads at the reload facility in Clarkia, Idaho, and is preparing to make the return trip to St. Maries on a bright July afternoon in 2005. The St. Maries River glistens in the late afternoon sun as the St. Maries River Railroad's inbound Clarkia Logger rolls toward St. Maries, Idaho, in July 2005. 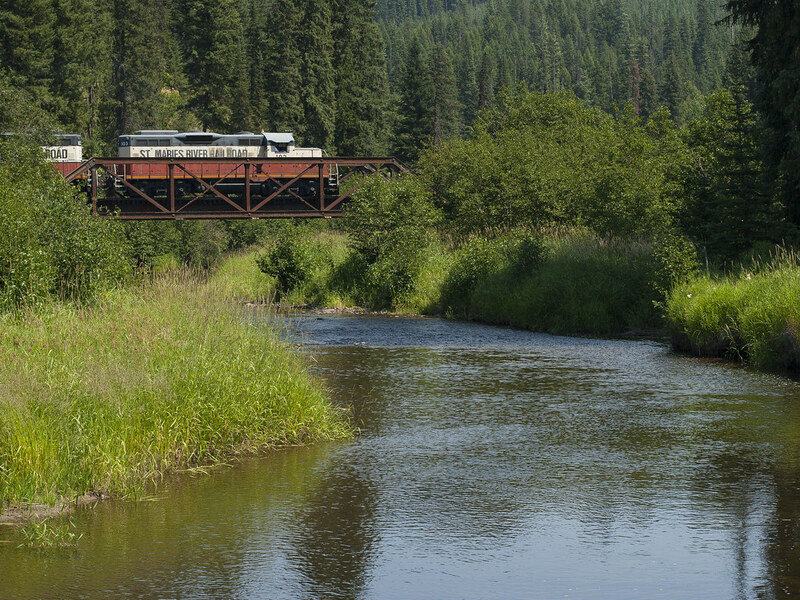 Brake shoes smoke as the St. Maries River Railroad's inbound Clarkia Logger rolls down its namesake Idaho stream on a July afternoon in 2005. The railroad operating nearly four hundred former Milwaukee Road log cars, all with friction bearing trucks. 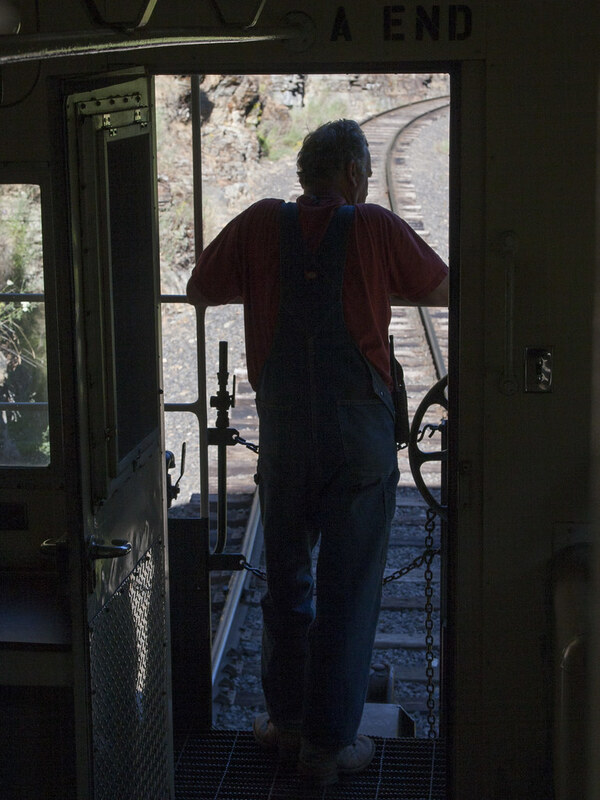 St. Maries River Railroad conductor Pat Hough watches the tracks recede from the backdoor of his caboose on the inbound Clarkia Logger in July 2005. St. Maries River Railroad conductor Pat Hough oversees the progress of the inbound Clarkia Logger from the cupola of his caboose as the train nears St. Maries at the end of a long day in July 2005. 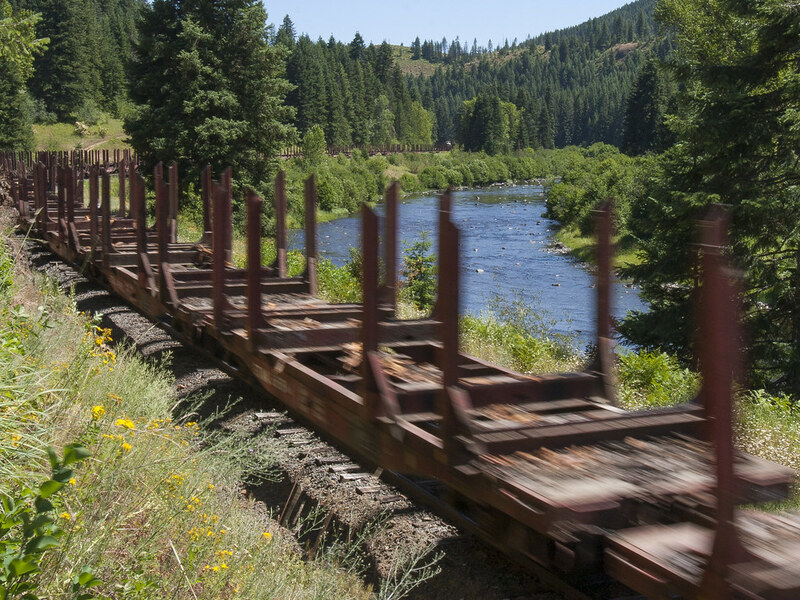 The St. Maries River Railroad's outbound Clarkia Logger crosses the railroad's namesake river between Emerald Creek and Clarkia, Idaho, in July 2007. 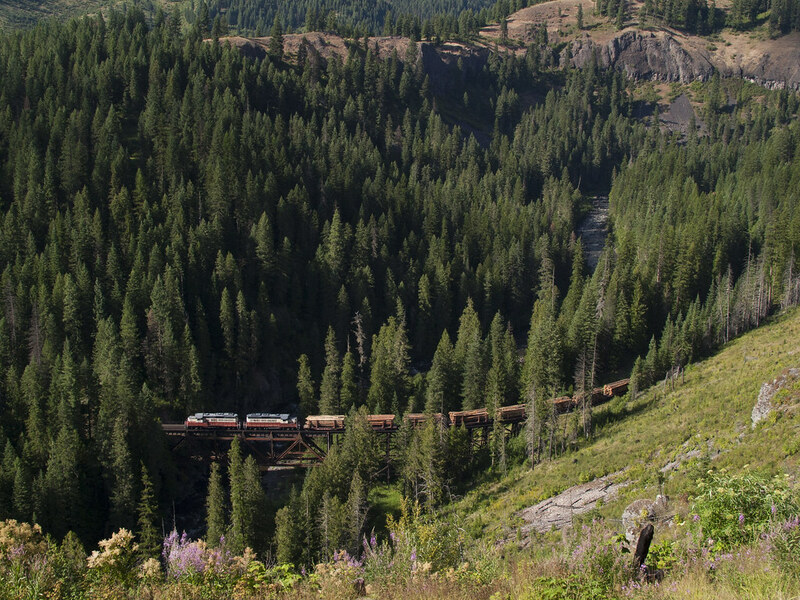 The St. Maries River Railroad's inbound Clarkia Logger threads the canyon of the St. Maries River with fifty loads of Idaho timber on a July afternoon in 2007. Loaded log truck in St. Maries, Idaho, in July 2007. The St. Maries River Railroad's office in the former Milwaukee Road depot in St. Maries, Idaho. The railroad's two ex-Milwaukee Road SW12000 diesel switchers rest outside the three-stall engine house in the background. 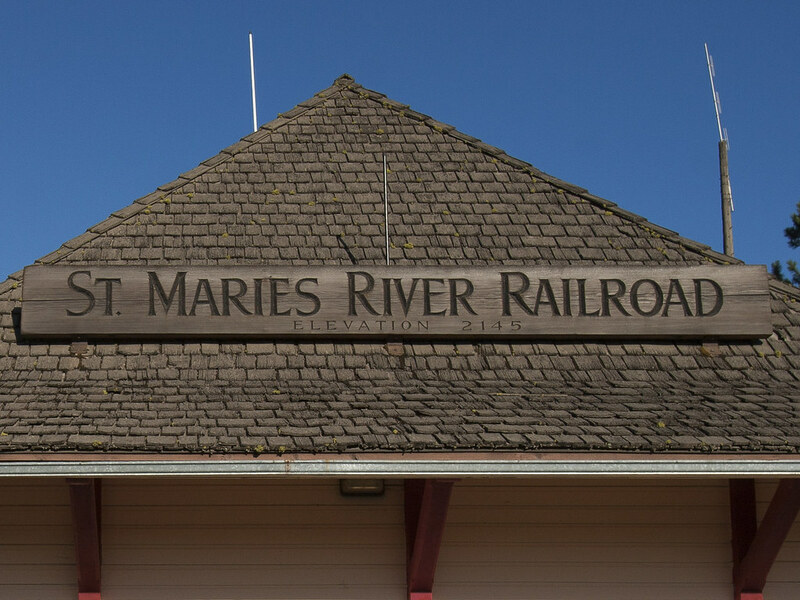 Carved wood sign for the St. Maries River Railroad on the depot in St. Maries, Idaho.